Ballymena’s Steven Donnelly plans on keeping up his winning run at the Ulster Hall when he returns to action in Belfast on Friday. 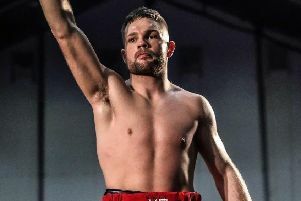 Donnelly had a successful 2018 which saw him win all four of his fights, and he’s now looking forward to competing at a familiar venue. “The Ulster Hall is the home of Ulster boxing. I’ve boxed in it lots of times during my amateur career, and I think I won three or four senior finals there. I’m unbeaten in the Ulster Hall and it will stay that way on Friday. “We’re a few days out from the fight now and I’m feeling sharp and ready to put on a performance for the home fans. I’ve prepared really well for this and had some great sparring. “I had a brilliant year in 2018 and now it’s about building on that. MTK Global kept me busy and helped me fight on some great cards, such as the Carl Frampton undercard at Windsor Park, the Amir Khan undercard in Birmingham, and at Madison Square Garden in October. The main event of the card alive on iFL TV sees a rematch between Conrad Cummings and Luke Keeler for the WBO European middleweight title. 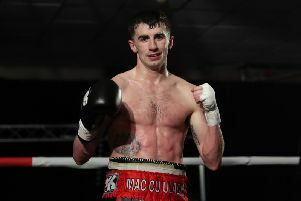 Tyrone McKenna, Steven Ward, Steve Collins Jr, Padraig McCrory, Sean McComb and Taylor McGoldrick will feature.